Russia’s complex visa system may seem like it’s out to get you, but this checklist will help you navigate it successfully. Russian visa requirements have eased up just a bit in recent years. If you’re going on a tourist visa, you no longer need an “invitation.” However, you do have to provide official confirmation of your travel dates from your hotel (or wherever you’re staying.) So, make your travel plans first, and then apply for a visa. Also, keep in mind that if you’re applying for certain types of visas, you will need an invitation from a sponsor. RushMyTravelVisa can help you determine the visa requirements for your trip, and obtain an invitation if necessary. Your passport must be valid for at least six months past the date you plan to leave Russia. Russia likes to make a statement with its visa, so you’ll also need no less than two blank pages in the back. If your passport expiration date is looming or you need more pages, take care of that prior to applying for your Russian visa. If you’re in a hurry, RushMyPassport can help! 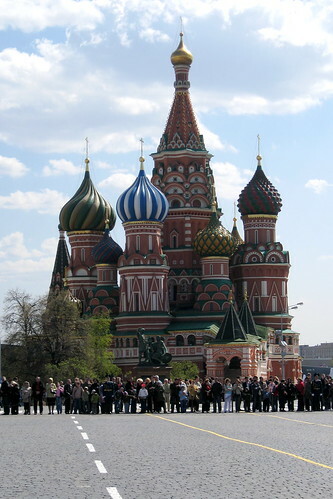 Russia requires you to be covered by a medical insurance plan during your stay there. Think you’re already covered? You might not be- most US medical plans won’t cover you overseas. Find a medical plan that does- you may need proof to get your visa. You’ll need one passport-style photo to go with your visa application. If you wear glasses, check your passport photo to see if you’re wearing glasses in it. If you are, keep the glasses on for this photo shoot, too. If not, take them off. Fill out your Russian visa application online here, then print it and sign it before submitting to the appropriate Russian consulate. Please note that the Russian Consulate may request additional documents as well, including but not limited to bank statements, a statement from your employer about how much money you make, documents related to property ownership, and a certificate that gives information about everyone in your family. On that note, unless you’re already intimately familiar with the Russian visa process (and perhaps even if you are), using a visa expediting company like RushMyTravelVisa saves you time and stress. Our visa experts can review your itinerary, determine what types of visas you’ll need for your trip, help you gather the required documents and submit the application to the Russian consulate on your behalf. Using RushMyTravelVisa, you can avoid common errors that could compromise your Russian visa application. Need a Russian visa? Don’t get lost in a maze of red tape. Apply with us today! This entry was posted on Wednesday, November 20th, 2013 at 5:21 pm	and is filed under Country-Specific Visas. You can follow any responses to this entry through the RSS 2.0 feed. You can leave a response, or trackback from your own site.